Like 63,000 employees at Hartsfield-Jackson Atlanta International Airport. Seven cities in South Fulton all working together. Or 50,000 acres of undeveloped land. Take your pick – all provide an illustration of opportunity in South Metro Atlanta. This regional approach seeks to leverage the enormous economic engine of the airport, with its $34.8-billion direct impact on Metro Atlanta, to create places where companies want to locate and people want to live. 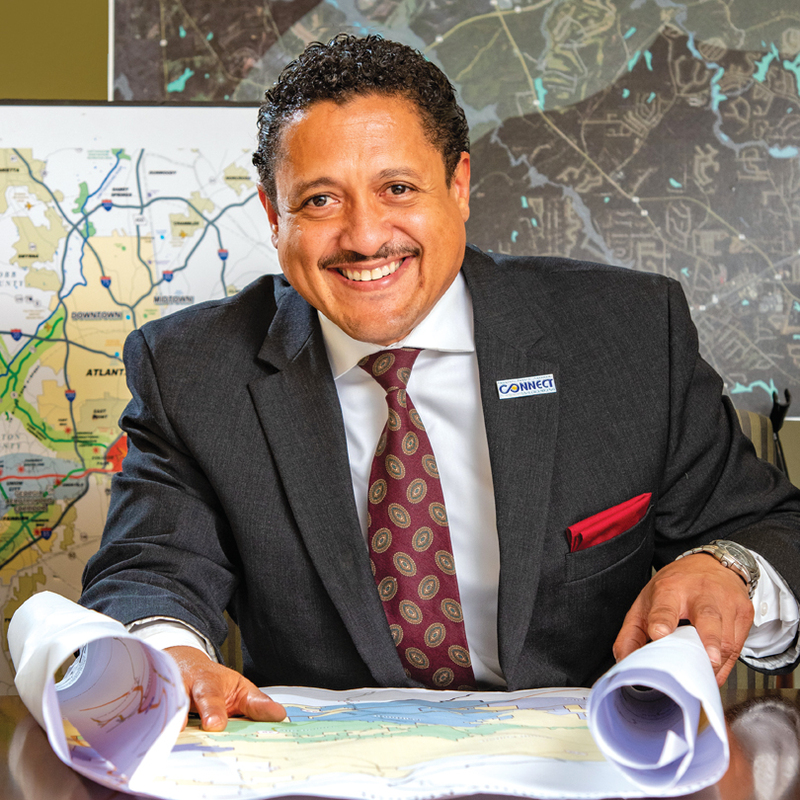 It’s a direct effort in South Fulton, Clayton and Henry counties: “The majority of companies locate to Metro Atlanta because of the airport,” says Shannon James, president and CEO of the Aerotropolis Atlanta Alliance, an organization that encourages investment and seeks to improve quality of life in the area. It’s indirect, too, in places like Fayette County, where cities including Peachtree City have attracted residents connected to the airport, and which is now leveraging another economic engine – Pinewood Forest, the massive mixed-use development across from Pinewood Studios in Fayetteville. Groundbreaking has started on the town center, which will feature restaurant and retail, and in February the development announced a new 52,824-square-foot office building with ground floor retail and a rooftop restaurant will be added to the mix. In Coweta County, Trae Westmoreland, president of the development authority, says his area also benefits from its proximity to the airport – and to Metro Atlanta, which offers big-city amenities and quality of life just a short trip away. Two things are really boosting the South Metro’s air speed – local leaders embracing a regional approach (cooperate rather than compete) and a change in the narrative, from “the Southside” to “Aerotropolis.” Instead of a historically traditional city, with a commercial district at its center, an aerotropolis makes the airport its center and plans for development around it. Logistics are a natural fit when it comes to economic development, along with aerospace and hospitality. The $6 billion in upgrades at the Atlanta airport include a big expansion of cargo and warehouse facilities, which presents a significant opportunity for the area, says Gerald McDowell, executive director of the Aerotropolis Atlanta CIDs (Community Improvement Districts). The CIDs (Airport West and Airport South) are conducting a study “to look at how freight and cargo move in and out of the airport area [and] determine if we have an adequate road network to support that growth in the airport area as well as throughout the entire Metro Atlanta region,” McDowell says. Airport City, one of two major planned mixed-use developments, each about 300 to 400 acres, would include office and retail space, single-family and multi-family homes and hotels. Groundbreaking could start this summer. Located in College Park, it’s close to Porsche, Delta and Chick-fil-A headquarters, plus the new Atlanta Hawks G-League team arena and BMW’s new technical training facility. The arena will also expand the amount of convention space available, while BMW’s facility will draw visitors from around the region. Combined with the nearby location of Porsche in Hapeville, the Aerotropolis area is establishing a presence in the automotive sector. Mountain View, another area where more dense development is proposed, had been the subject of some controversy in late 2018 when property owners and the Clayton County Commission clashed over zoning. Khalfani Stephens, executive director of the Development Authority of Clayton County, says leaders are working with property owners to discuss issues and explain the development plans. Mountain View is along the route of MARTA’s planned commuter rail line from East Point to Morrow, Jonesboro and Lovejoy, which is likely to transform the region. “We want to have some high-density, class-A office space surrounded by accompanying retail and an opportunity for people to live close to where they work,” says Stephens. Connectivity and transit – in all forms – are crucial to the area. A second phase of MARTA’s expansion into Clayton includes plans for bus rapid transit (BRT) that connects College Park with Riverdale and Morrow. The CIDs have also launched a “smart corridor” study of Virginia Avenue, stretching from Main Street in Hapeville through East Point to Main Street in College Park, examining possibilities like adding bike lanes and accommodating autonomous vehicles and shuttles. They’ve worked with the Georgia Department of Transportation on lighting and landscaping at the new diverging diamond interchange at I-285 and Camp Creek Parkway; the interchange is designed to improve access to the airport and the region. It also leads right into the Airport City area, says James. Or as Westmoreland puts it: When the state economic development teams are recruiting, they can’t go looking for 50 acres in North Atlanta – that kind of land just isn’t there. There’s land available in Henry County, too, where the Board of Commissioners in February voted to move forward with master planning for a 6,000-acre site. Near the Clayton and Spalding counties line, the available area is around the Atlanta Motor Speedway. There’s also room for the ambitious AeroATL Greenway. The proposed network of multiuse trails running through College Park, Hapeville, East Point and Forest Park is “our version of the BeltLine,” says McDowell, referring to intown Atlanta’s in-progress trail loop and parks, offering both quality of life and new ways to get from Point A to Point B. One of the greenway’s “model miles” could be constructed along the Flint River in conjunction with Finding the Flint, a project to restore the urban headwaters of Georgia’s second-longest river. Most people don’t know the river begins just north of the airport and flows underneath it for about 2 miles – the organization calls it “the most important river Atlanta’s never heard of.” These efforts helped the Aerotropolis area win the Great Place Award from the Atlanta Regional Commission in 2018. South Metro had a number of new jobs and project announcements in the past year. In Henry County, executive director of the development authority Leonard Sledge says 2018 was a “fantastic” year, with projects resulting in more than $29 million in investment and 374 new jobs. Among them, existing business De Wafelbakkers (a frozen pancake maker) is adding more than 80 new jobs in McDonough as part of a $15-million expansion, while luxury bath manufacturer Hydro Systems opened a new facility and initially added about 60 jobs. Logistics company GFA is locating a facility in the county to distribute LG products, resulting in about 35 jobs. In Clayton County, LTI, which makes food service equipment, opened a new headquarters building in Jonesboro, and HD Supply leased 1 million square feet of space at Gillem Logistics Center for hundreds of employees. And there are plans for a five-star hotel, according to Stephens. Coweta County notched several new projects last year. Saddle Creek Logistics moved into a 1.2-million-square-foot building in one of the county’s industrial parks, bringing 150 new jobs. Beverage industry supplier Corvaglia opened its facility last year with about 40 new jobs, and auto parts maker Vintech created 60 jobs at its facility in South Newnan Industrial Park. Existing businesses Hitachi and Cargill also expanded and added new jobs. It’s been so busy in Coweta that Westmoreland says they’re basically in constant reactive mode right now. Not that he’s complaining: Last year was “a very, very good year,” and 2019 is shaping up to be the same. In Fayette County, transportation logistics company SMC3 broke ground on a new headquarters building in Peachtree City. And in Fayetteville, close to Pinewood Atlanta Studios, a 145-acre mixed-use development, Folia Crossroads, is being planned. Joan Young, president and CEO of the Fayette County Development Authority, says that leaders are working as much on placemaking – a process that considers a location’s assets, potential and inspiration to create public spaces that connect people with a place – as on recruiting businesses, because the two are increasingly intertwined. “Traditionally you think of jobs and CapEx [capital expenditures],” she says. “But we’re seeing a bigger picture evolve that’s about quality of life and that takes advantage of what we’ve got, what we have to offer and expanding and bettering it.” She points to efforts in Peachtree City and Tyrone to reimagine their downtowns to include public places where people can gather, as well as the ultimate in planned communities with Pinewood Forest. Across the region, workforce development is a key issue. “The more skilled jobs, the technical jobs, those are becoming more of a challenge [for employers],” says Sledge. Henry County leverages its college and career academy, the Academy for Advanced Studies, and the ancillary location of Southern Crescent Technical College. And it’s not just manufacturing. Clayton State University in Morrow has a bachelor’s in film production, and Southern Crescent’s main location in Griffin offers a film technology program that trains students in film tech needs such as electrical, lighting, hair and makeup, for a growing industry. That’s just one of the out-of-the box approaches Spalding County is taking toward economic development. The past year saw a couple of larger projects come to fruition: the opening of a Dollar General distribution center – a project shared between Spalding and Butts counties – that added 535 jobs to the area, and the University of Georgia’s Food Product Innovation & Commercialization Center, which David Luckie, executive director of the Griffin-Spalding Development Authority, says has long-term potential to generate new jobs. Now the biggest challenge for Spalding County is starting a new industrial park – the current one, located at the Lakes at Green Valley (a mixed-use eco-park with green building codes) has only two sites left. Luckie says the county is getting creative, talking with private developers and exploring ways to keep the momentum going while working on a new park. Going from “Southside Atlanta” to “Aerotropolis” is more than just branding, leaders say. It’s acknowledging that things have changed and continue to change in an area that has lagged Atlanta’s north side in terms of economic development, residential offerings and just plain perception. Take Clayton County schools, for example. During the Great Recession, the school system lost its accreditation, and many still perceive of the system that way – but that was 10 years ago. The system was in fact accredited in 2013, and two of its schools, Martha Ellen Stilwell School of the Arts and Elite Scholars Academy, are on the U.S. News and World Report list of top schools in the state. If you’ve ever wanted to walk on the wing of a 747, here’s your chance. It’s just one of the unique experiences you can have at the Delta Flight Museum, a hidden gem of an attraction tucked into two hangars (one of them is the company’s original hangar in Atlanta) and surrounding outdoor space near the Hartsfield-Jackson Atlanta International Airport. With its genesis in 1990, when some former Delta employees began to search for one of the airline’s first Douglas DC-3 aircraft from the 1940s, the museum got its start in 1995 as a collection mainly for employees. Open to the public since 2014, it features Delta airplanes (including a 767), memorabilia and archival collections. It’s quite a tour through the history of aviation. That DC-3, which they found in 1993, is one of the highlights of the museum. Its first commercial flight was from Atlanta to Fort Worth in 1941. A painstaking restoration involved having window frames custom-made from aluminum and some areas reconstructed from photos because plans no longer existed. Now viewers can see it in all its glory, complete with toggle switches and wool fabric. Other popular parts of the collection include the model airplane room and the historic flight attendant uniforms as well as the new Zac Posen versions that debuted in 2018. There’s even a flight simulator (the only full-motion simulator in the country that’s open to the public) where you can practice takeoffs and landings for a hefty additional fee of $425. But without a doubt, the one that stops people in their tracks is the 747-400, the first one Boeing delivered to a commercial airline. “It’s one of those experiences you need to have firsthand,” says Cherea Thomas, manager of development at the museum, about getting up close and personal with the huge airplane. The iconic 747 is a hulking, well-traveled beauty that’s logged more than 61 million miles (enough to travel to the moon and back 250 times). You can go all over the plane, inside and out – reclining in the first-class seats, examining the cockpit and getting a view of what happens behind the walls with the electrical systems, fuel tanks and actual systems that control the plane. “It’s one thing to fly on a plane, but when you can actually explore it – walk around it, go inside and see everything – it really opens your eyes,” says Thomas. Tickets are $15 for adults, $10 for kids. The museum is open every day except Wednesdays. Guided tours are available on Tuesdays at 1 p.m.; see the website, deltamuseum.org, for details. And yes, there’s a gift shop.